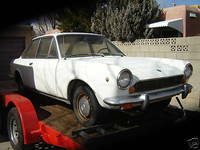 I was late on the draw posting anything about this coupe, but this was a 1969 124 Coupe with an odometer reading 40-something thousand miles, and apparently very little rust on Ebay out of Albuquerque New Mexico. The seller offered a lot of text and some detailed description of the car's condition as well as some decent photos to show what it looks like underneath (which, of course is what really mattters!). 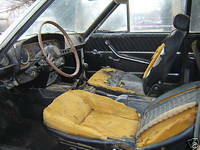 The interior looks like most - especially southwestern examples - of these do in this condition....like a bomb went off inside. Luckily, all of that except maybe the dash pad, is fairly easy to source or reproduce. Hopefully we'll see this one brought back to life! The auction is closed at $1,125 on February 3, 2009. Another 124 Coupe back on the Road; Nice catch, Dave! 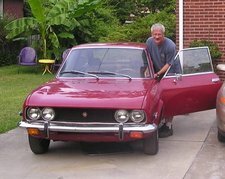 I just heard at Mirafiori, my friend Jim from Virginia helped a buddy travel to North Carolina and bring home this 1970 FIAT 124 Sport Coupe. I don't have the link from the Craigslist ad, but the car was the quintessential "barn find" - its secnd owner drove it until 1987 and parked it in a warehouse on his property. Then, 21 years later, having not run in the interim, sporting only 145K miles, no rust and most of the dust collected during that time, it resurfaced for sale. It's new owner, Dave in VA should be very proud. 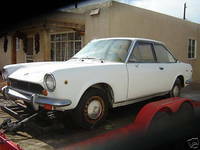 As I understand it, the car is stock/original with the original 1438cc twin cam, but does have aftermarket wheels and Ansa exhaust. All of 124 Coupe folks will bill be watching eagerly to see this one back action. It's great to hear these stories of good saves...contrats, Dave!